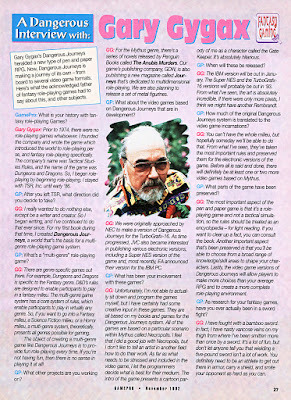 Today would be the 80th birthday of Gary Gygax, co-creator of Dungeons & Dragons (D&D), who passed away in 2008. 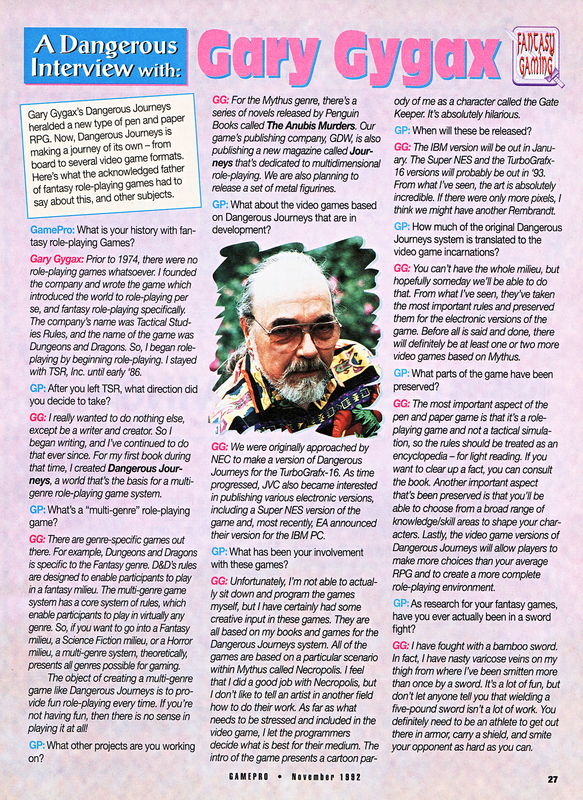 Along with Dave Arneson, Gygax released the pen and paper role-playing game (RPG) in 1971. He also co-founded Tactical Studies Rules (TSR) in 1973 with Don Kaye and in 1977 began work on Advanced Dungeons & Dragons (AD&D). 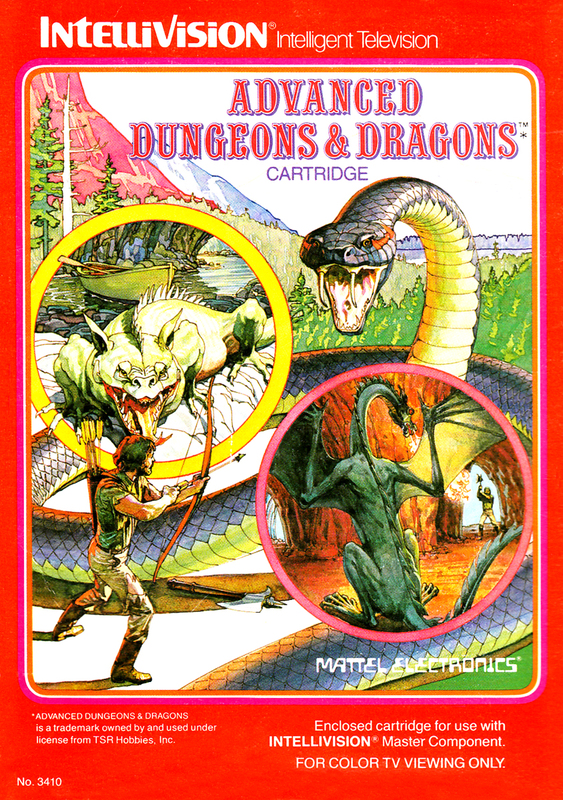 I've actually only played the pen and paper game one time which was back in the early '80s with my neighbor who was a big fan of D&D and had many of the action figures as well. 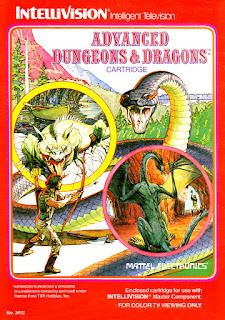 However, being a gamer I've certainly experienced D&D through many computer and video games, including but not limited to Advanced Dungeons & Dragons Cartridge (Intellivision), Pool of Radiance (C64), Warriors of the Eternal Sun (Genesis), Dark Sun (PC), Baldur's Gate (PC), and Neverwinter Nights (PC). 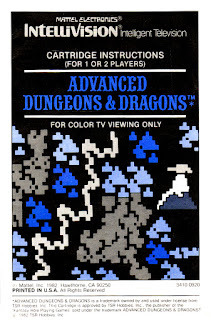 I chose to highlight the Intellivision game, which I'll abbreviate as AD&DC, in this post because it's the first AD&D game I played, though it is an action game rather than a RPG. As I mention in the video, "cartridge" is actually part of the game's title and was likely added to help differentiate the video game from the pen and paper game products as it was required by TSR. 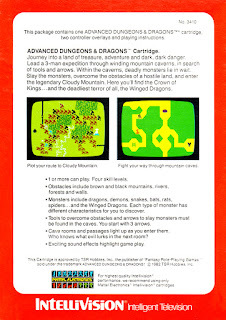 TSR required ADVANCED DUNGEONS & DRAGONS to be in all caps as well but I'm not going to write it that way, at least not outside of this sentence! 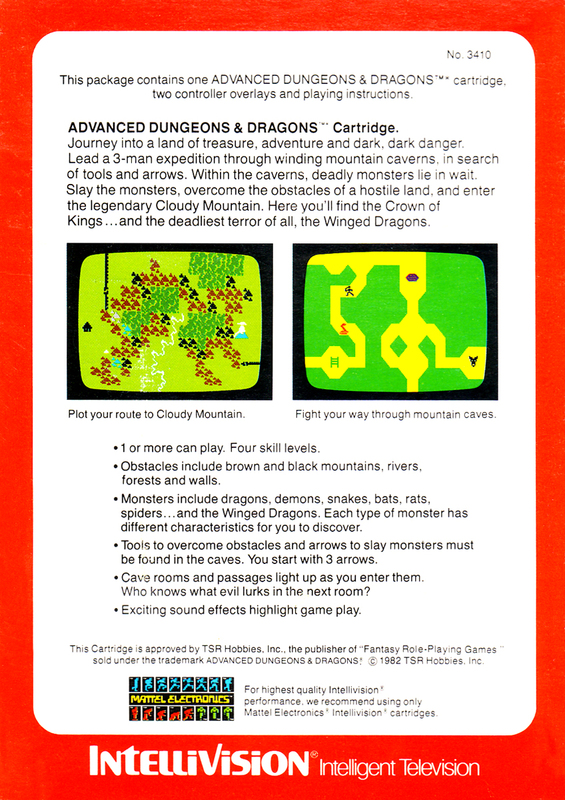 Also, the subtitle "Cloudy Mountain" was later added to the title after a second AD&D game was developed for the Intellivision called Advanced Dungeons & Dragons: Treasure of Tarmin Cartridge. 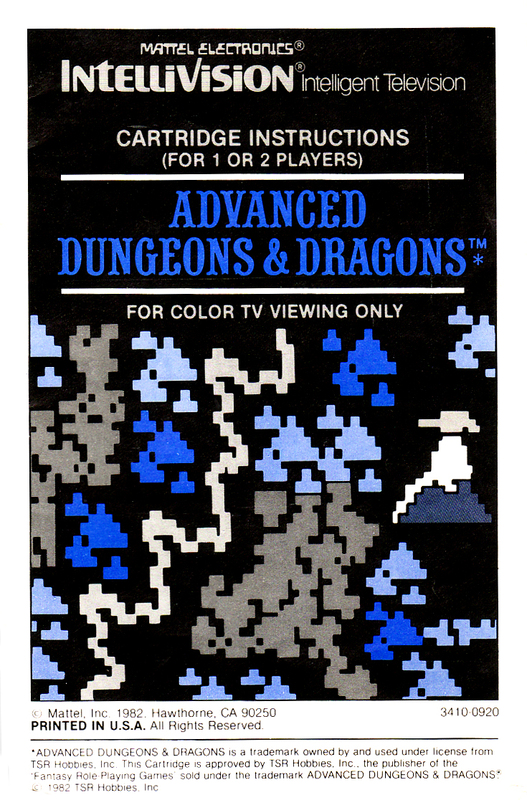 Developed by APh Consulting and published by Mattel Electronics, AD&DC is one of my favorites and arguably one of the best games for the Intellivision and of its generation. In AD&DC the player is required to navigate through mountain caves to acquire an ax, boat, and key that allows them to cross the map and reach the Cloudy Mountain. Inside the final mountain are two pieces of the Crown of Kings guarded by winged dragons; once both pieces are acquired the game ends. Each mountain features a random maze that is unveiled as players move and there is no telling which direction the path will twist and turn. This is important as the only weapon is a bow and arrow, and the arrows bounce off of walls and can easily fly back into the player's face injuring them. It's a risk to fire an arrow into a part of the map not yet uncovered but it can also be a life saver in order to avoid getting too close to enemies. Sound is where AD&DC shines as some enemies can be heard in the distance which builds tension and that's what may lead to firing arrows without knowing what's ahead. Arrows are limited, however, so depending on the situation it might be best not to waste them. Although there is only one character, a second player can join the game since both controllers work at the same time. 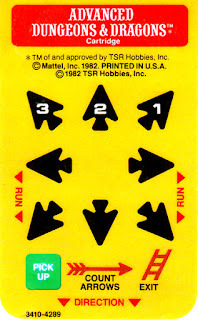 I'd often play with my neighbor with one of us controlling the movement and the other firing the arrows which is done using eight of the numbers on the keypad. The game has four difficulty settings and eight enemy types: bat, spider, rat, snake, blob, demon, dragon, and winged dragon. On the hardest difficulty the enemies are very fast so players have to react quickly. 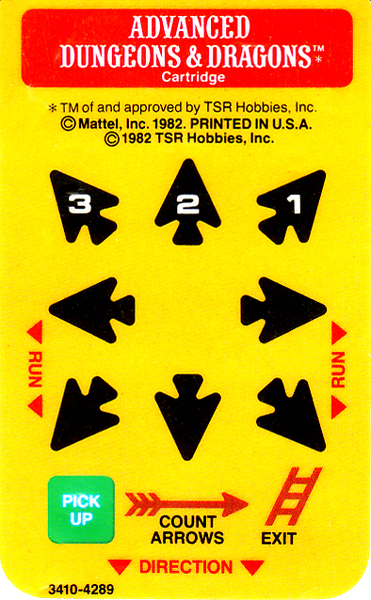 While the game has no scoring and thus no high scores to beat, the replay value is quite high due to the randomness of the mazes, the challenge presented on the higher difficulties, and the option to add a second player. Of course, it also helps that it's fun to play, plus it can be completed as quickly as 20 minutes or players can spend hours exploring all of the mountains littered across the map.